If you've been using Wordpress long enough, then you probably know that despite it's extensive capabilities, it can often be quite difficult and annoying to modify the smallest things if you don't know where to look. One of those 'things' is eliminating and replacing the awful 'uncategorized' category. When you first launch your Wordpress site, everything you post will automatically be under 'uncategorized' until you change the default. Here are a few steps to get rid of that pest and make nice, pretty small trail of categories and sub-categories that lead to the current web page and make it easier for the user to know their current location. To create a new category, go to posts -> categories -> add name -> add slug (usually just the name) -> no parent -> add new category. After you have created your new category, go to settings -> writing. In writing, you will notice that 'uncategorized' is the default post category and is automatically selected as the category that all posts are written to. To change this, click on 'uncategorized' and change it to your new category. (In this case, my category is 'All'. 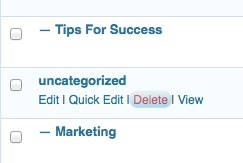 Now that uncategorized is no longer the default category, it's time to get rid of it completely. 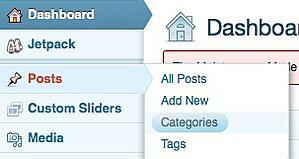 Go to posts -> categories. Congratulations! Your days of being uncategorized are over. Comment below if this helped you!